My very own babies, born in the winter of 2004. The first weeks and months of life set the stage for the puppy's personality for the rest of his life. 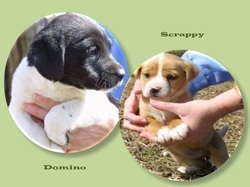 Puppy Social Gathering helps them with the skills they need to cope with an ever changing world. sounds and smells, and the puppy will have the opportunity to interact with other humans he doesn't live with. This creates a well-socialized puppy who is far more comfortable in his world for his entire life, and as a result far less likely to ever become fearful and/or bite. You will also have a great time watching your pup play with his new pals, while at the same time doing one of the best things you can to ensure he has a long stress free life. If your puppy is between ages 8 -20 weeks, register to start your 3 week session anytime there are openings. $30 for 3 weeks or $10 for 3 weeks if also enrolled in Puppy Manners 101. Puppy Social Gathering may be repeated until the puppy is 24 weeks maximum if started before 16 weeks.